That leaves white and red. This week I am trying to make a compelling mono white deck, my least favorite color. Mono white and I just don’t see eye to eye. Was I able to actually pull something together or will I just go on a rant about the shortcomings of mono white in commander? Read on to find out! Everyone has their personal favorite colors that they always seem to gravitate to or shy away from. I actually don’t dislike white at all when it is paired with almost any other color combination. 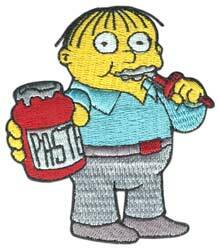 However I cannot stand mono white. There is nothing in mono white that lures me in. 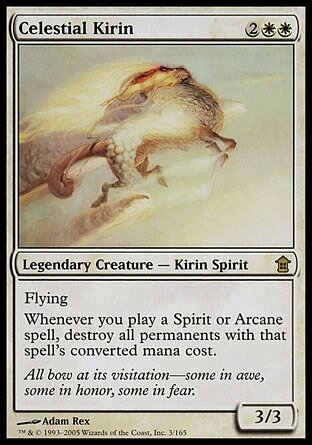 The last mono white list I ever owned was a 60 card banding deck circa 1995 that included such gems as Prismatic Ward and Kjeldoran Skyknight. Mercifully, a pen exploded all over it in my backpack and I never built another white deck. 1. No lifegain theme: I didn’t want the deck to just gain dump truck loads of life. It isn’t particularly original or even that effective in commander. As I mentioned in my Oloro article, you can still get blasted by 21 general damage or 10 poison no matter how much life you have. 2. No stax: I didn’t want to create a lock-down resource denial deck with cards like Thalia and Armageddon. This deck should be fun to play and relatively fun to play against. 3. No voltron: This is another common way to build mono white, so I decided to increase the challenge level and try to avoid going the equipped monster route. I initially thought this would eliminate the strategies everyone has seen before and allow me to craft something a bit more unique. I fired up magiccards.info and started to search for cards to create something the like of which no one had ever witnessed. a. 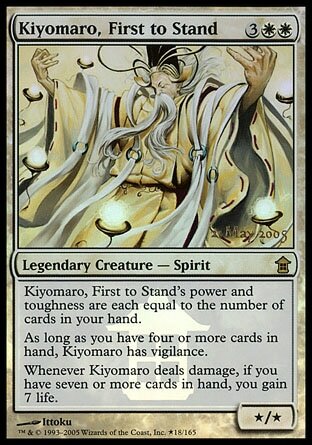 If a mono white general is cheap to cast it either violates one of my three ground rules above, or it’s a Kamikawa creature with bushido (woohoo). b. If a mono white general is expensive to cast it usually isn’t worth it. 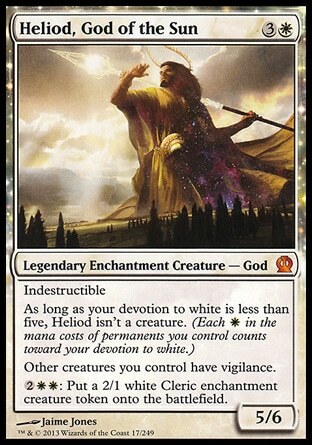 Heliod: My reasoning was that since none of the existing generals jumped out at me, I’d wait for Theros to be spoiled (all of the decks except white were basically designed during the CommanderCast offseason) since it was known there would be a god for each color. Having tokens that are also enchantments seems like a great way to take advantage of cards like Serra’s Sanctum and Sphere of Safety. My list even had some cards that benefitted from Cleric tribal. However, 4 mana is still quite a price to pay for a 2/1 even in commander and the whole thing felt a bit lackluster to me. Scrapped. Not much use in posting a deck that would probably be an 80% match to this one. Scrapped. 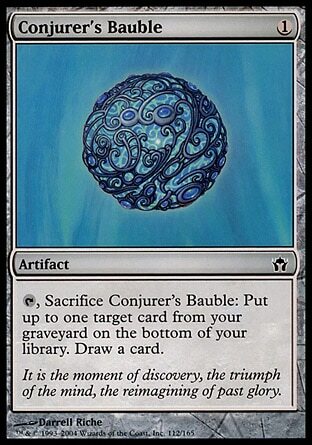 Mono White Eggs: Ok at this point I was growing frustrated with the lack of Johnny cards in mono white so I started crafting a monstrosity of a deck that featured spellbombs, baubles and spheres that could all be quickly cast and then brought back with something like Second Sun or Open the Vaults. You could build your storm count up and get lots of triggers of some sort and finish off your opponent with…hmmm… Scrapped. 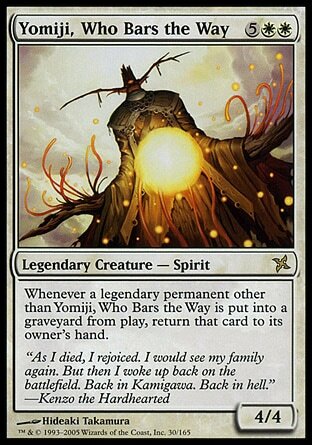 Yomiji, Who Bars the Way: What a great build around me general. You could run Krark-Clan Ironworks and Mox Opal for infinite mana with this guy! Mindslaver goes right back to your hand! All for the bargain cost of seven!? mana. Scrapped. Finally after nearly giving up I found a general that gave me a glimmer of hope that I could craft something unique. My rule of thumb for building commander decks is that a general should not cost more than 5 mana unless it is part of your plan for winning the game outright. If the commander is only there for utility it becomes difficult to afford any additional commander tax to get a marginally neat effect. This was the problem with Yomiji. If he died you were looking at 9 mana for his unique, but not immensely powerful ability. The commander I found slotted it right below 6 mana, which I think is reasonable. I decided to play to one of whites primary strengths. Card draw. Be sure to sound off in the comments if you have crafted a unique mono white list. I would love to hear about it. Until next week, make sure your pen doesn’t explode on your banding deck.